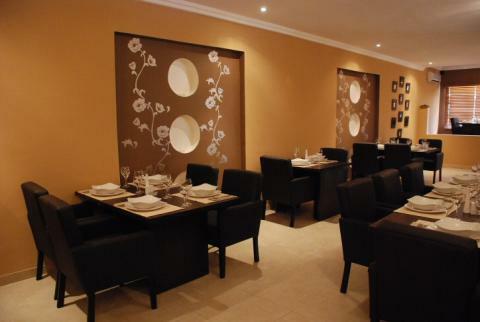 II, Abuja, operating under the name VANILLA Restaurant and Cocktails. Our restaurant as a seating capacity of 34 and can be expanded to accommodate 60 for special functions. The restaurant serves fusion food from different parts of the world including dishes unique to the restaurant, the best way to describe us is that we are continental with a world accent. (Where else can you get Steamed Sole with lemon and saffron butter, served with sauté potatoes on the same menu as Jamaican Jerk Chicken on a bed of pickled cucumber with chips and Jollof Rice all fighting for your attention). Our chef has lovingly prepared a menu that would make any food lover quiver with excitement, we use locally sourced ingredients and spices from all over the world to give our dishes a uniquely authentic taste. I being a food lover insist on good size portions! Our head barman has created some wickedly delicious cocktails and mocktails for your drinking pleasure, and in a couple of weeks we intend to start our happy hour, with unbelievable discounts on drinks, for that after work tipple.